This week marks the launch of a milestone venture for Las Vegas art-rock collective, Candy Warpop. They have recently come forth to call upon the support of their loyal followers by way of an online campaign that will enable them to release a new full-length album. 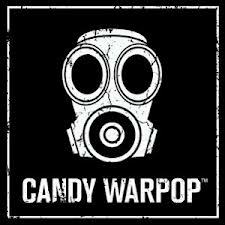 It works like this: fans eager to get their hands on a new release from the Warpop crew will be asked to donate generously to the cause via Kickstarter. The money will then be used for studio time and recording costs so that the album can be promptly distributed in a timely fashion (tentative release date is early summer). The goal is for the band to receive $3600 in 30 days. Any money that is accrued beyond that goal, will go towards recording more tracks, mixing and mastering costs, and physical CD production. Why donate to the cause? Well, aside from offering your small, but important contribution to the Las Vegas music scene by endorsing a fresh and innovative group of artists like Candy Warpop, there is also a tempting platter of unique incentives for those who donate stemming from shirts and posters to exclusive downloadable content, such as the newly released track, "Trigger" - a fiery and twisted sonic assault that tosses the listener around the room before gently easing them back down to the floor where they can writhe in the dizzying after-effects - which is only available to those who donate.